Senior Chinese lawmaker Wang Chen has called for persistent efforts in protecting the marine environment and in the battle against pollution. 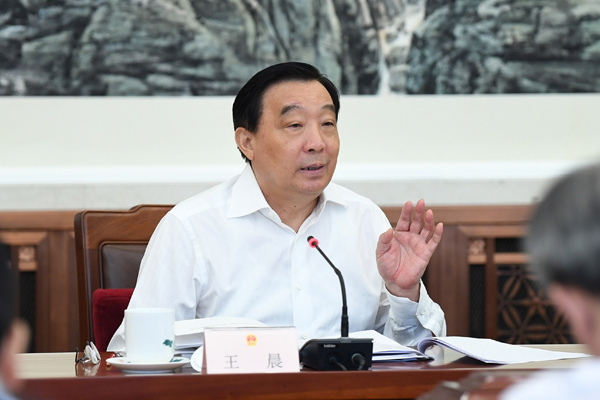 Wang, vice chairman of the Standing Committee of the National People's Congress, made the remarks on Tuesday at a plenary meeting of the inspection group that examines the enforcement of the country's marine environmental protection law. Environmental protection is a must in upgrading industrial structures, achieving high-quality development and meeting people's ever-growing needs for a better life, and the current efforts in ecological conservation will benefit many generations to come, Wang said. He thus asked for a stronger hold of political orientation and more consistency in protection efforts, in order to further contribute to building the nation into a strong maritime country and a "Beautiful China". The marine environmental protection law should be comprehensively implemented with focus on solving problems, while more suggestions should be proposed in terms of institution building and supervision, so as to ensure more efforts in controlling drains that deposit into the sea, land-based sources of pollution and other key areas of concern, Wang said.